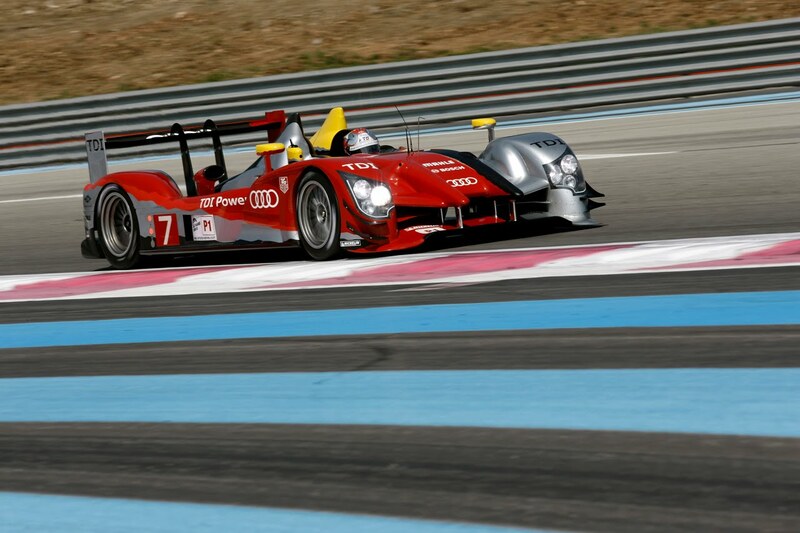 The new Audi R15 Plus is making a strong debut with Allan McNish posting the fastest lap during yesterday's testing at Paul Ricard and Dindo Capello clocking the second fastest qualifying time to start on the first row of tomorrow's 8 hours of Le Castellet. Dindo's lap time was a blazing 1m 41.632 - just over 4 tenths of a second behind the Oreca Peugeot. 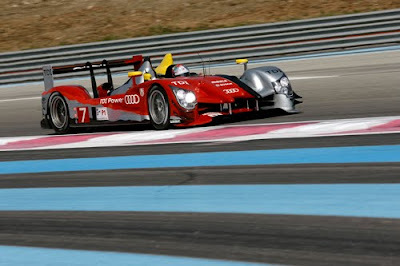 Ingolstadt/Le Castellet, April 10, 2010 - The 2010-spec Audi R15 TDI (internally labeled "R15 plus”) will tackle its début race from the front row of the grid. Dindo Capello recorded the second fastest time in Saturday’s qualifying for the 8-hour race at Le Castellet (France). 37 days after the roll-out of the R15 plus, the test race at Le Castellet marks the next phase in the development program of the diesel-powered sports race car. After aerodynamic tests at Homestead (Florida), a multi-day endurance test at Sebring (Florida) and tire tests at Monza (Italy) Audi Sport Team Joest uses the season opener of the Le Mans Series at Le Castellet to begin the detailed race-setup work on the updated LMP1 car. The first conclusion: The R15 plus is sensitive to the slightest changes and is immediately fast. In two of the three free practice sessions Dindo Capello and Allan McNish set the fastest time. In qualifying, only the Peugeot 908 of the Oreca team was less than half a second quicker, which - contrary to Audi Sport Team Joest - had previously tested at Le Castellet like most of the other teams. In order to gain as much experience as possible, Audi Sport Team Joest even used the 20-minute qualifying session on Saturday to compare two different setup versions. The team will use the race on Sunday to collect as much data as possible for the Le Mans 24 Hours on June 12/13. Dindo Capello and Allan McNish will tackle the 8-hour race alone after Tom Kristensen decided not to start at Le Castellet in consultation with Audi team physician Dr. Christian John and the team.